A large crowd in Houston watches as transwomen fight multiple attackers. In addition to the transphobia that fueled them, these attacks share one other disturbing trait: all were filmed by bystanders who captured and then shared the footage as a source of entertainment. Use the right search terms on the most popular video hosting sites and you’ll find thousands of them. Videos of these encounters are shocking not only in their quantity, but in their popularity among viewers, and the callousness of their responses. Homophobic, transphobic and racist remarks dominate the comments, and positive responses—from a thumbs up to a “LOL”—outweigh unfavorable responses by over tenfold. The wave of legal victories that the LGBTQ community has achieved in the United States has coincided with a backlash. Along with hate-based laws, advocacy groups are reporting an epidemic of violence targeting transgender and gender-nonconforming people. However, there are no federal requirements to report violence against people who identify outside the gender binary, leaving a dearth of data that is essential in making the case for policy change, countering negative public perception, and fundraising for direct services. 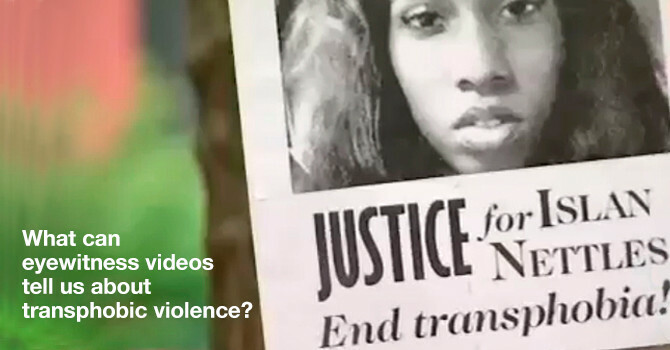 In an effort to address that shortfall, the WITNESS Media Lab is sourcing and analyzing data from eyewitness videos of violent acts against transgender and gender-nonconforming people that have been captured, posted, engaged with, and shared for entertainment. We believe that the findings can raise greater awareness and spark discussion of the cultural and political climate that is fostering discrimination, dehumanizing victims, and encouraging violence. In partnership with advocacy groups, activists, and academics, we will review and distribute the data along with resources and tools that will help them more effectively use eyewitness videos for their work. In the coming weeks, we will expand our initial data collection to include a variety of video streaming platforms and search queries. From cleaned and aggregated data, we will collect engagement metrics (e.g., shares, likes, etc.) to create a comprehensive report that analyzes and contextualizes the findings. The report will include visualizations of the data, an explainer video, and a resource list sharing our tools and methodology. How can advocates use eyewitness videos effectively in data collection, crisis response, and legal advocacy? What policies and tools can video hosting sites implement to prevent the re-victimization of people attacked on camera? How can journalists report on violence against the LGBTQ community using eyewitness videos effectively and ethically?